Once in a while, you get to do a job that turns out really super. 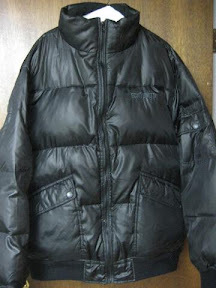 I replaced the zipper in this winter coat. It could have given me fits, matching all those horizontal seams, but this one went in beautifully. 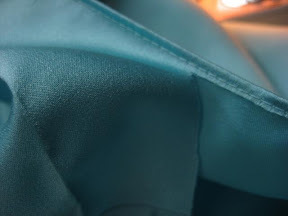 Thank goodness, because ripping stitching on that fabric is a pain. Here is the whole jacket. Look at all those points to match: top of collar, base of collar, three horizontal seams, top of waistband, bottom of waistband! Wow! Here's the top half close up. 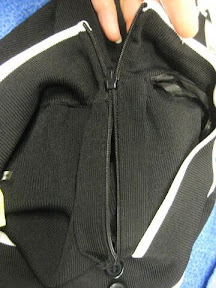 The top of the zipper looks off, but it's really just bending backward a bit. And here is the bottom half close up. Whew, lots of attention to detail on this alteration. I'm very happy with the result. 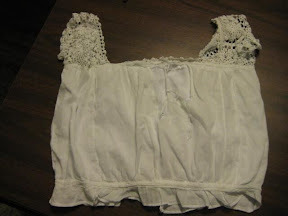 This customer found a lovely peasant style vintage top at a second hand store. Unfortunately, it must have had some old dirt holding it together, because parts of it disintegrated when she washed it. She came to me wanting a piece of fabric over the top front, to hide the decaying parts. As you can see here, the front center section of the top is badly worn and parts are missing. The client bought a nice piece of soft cotton to go over the existing piece. This shows a closer view of the damage. I created a replacement piece that was wider than the seam-to-seam area needing replacement. Then I gathered it slightly across the top, and even less across the bottom. 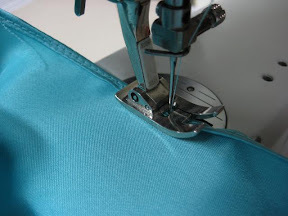 I folded under the sides and sewed them to the existing princess seam line. Then,, arranging the gathers, I got the top and bottom to fit into the princess area. Then I stitched across the top and across the bottom. Although the work was a bit tedious, I am very pleased with the results, and so is she! The website now has a Facebook page located Here. Please stop by and click the "Like" button next to the name to become a fan. You'll find my blog updates there. I also have a couple of questions in the "Discussions" tab that you can comment on. Thanks for visiting! This bridesmaid's gown was too long. 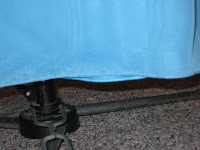 It had a little train on it, so the designer hemmed the front section with the serged edge, blind hem method. 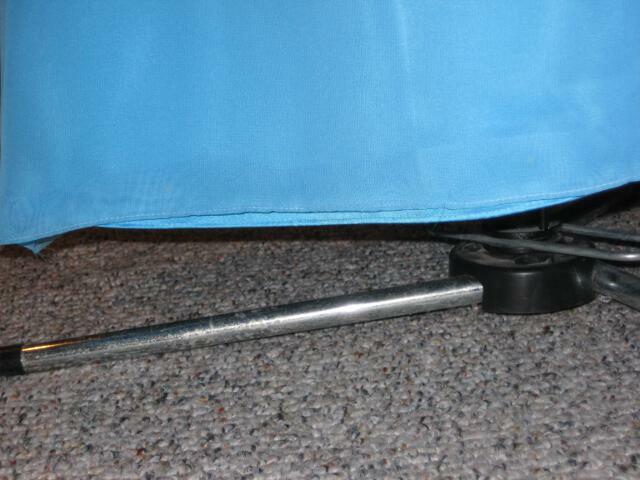 The remainder back/train area was hemmed using a rolled hem technique. I opted to make the whole thing uniform by altering it using a rolled hem all the way around. 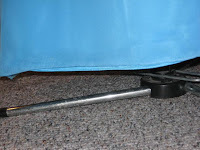 It was much easier and looked prettier than the 1½" hem where you could see the small blind stitches on the right side. 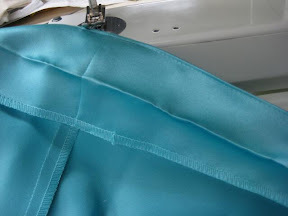 After pinning the hem up, I sewed a very narrow stitch along the folded edge, wrong sides together. You are looking at the dress from the inside here. Here is what this looks like when the first line of stitching is finished. Next, I cut the excess away, very close to the stitching line. Be careful here not to cut the stitches. Also be careful not to snip the front side of the fabric. 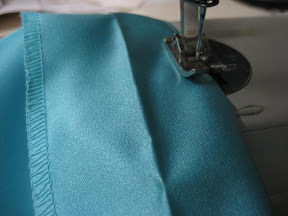 I use sharp scissors and cut rather slowly, especially if the fabric is lightweight, like a chiffon. 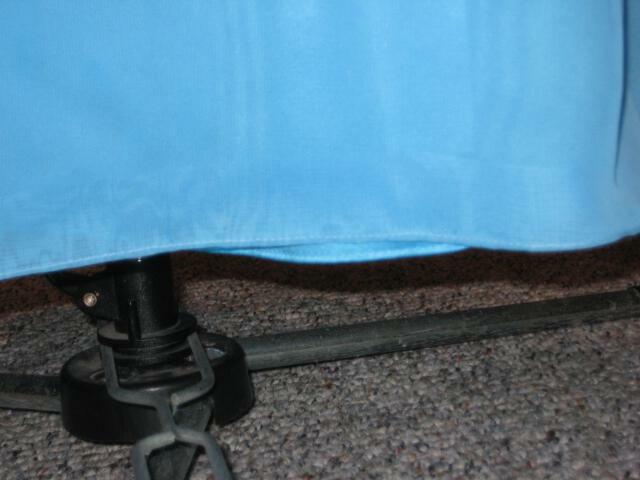 Next I folded the hem from the outside to the inside, essentially doubling it. Now the garment has a very skinny hem folded twice. Stitching again, very close to the folded edge, you will notice that you see two rows of stitching on the inside. But if you turn the garment to the right side, you will only see one. This is what you want. 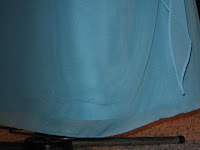 The full skirt hemmed with a traditional hem, will buckle when you try to fit in the hem allowance. This method allows for the underside to look as lovely as the outer side. Part of my business includes doing work for 2 local dry cleaners. Believe me, I see some really strange garments come through. The formal shown below had all of us laughing, so I thought I'd pass along the humor. Just promise me, if you see the lady wearing this dress, don't tell her about this post. What do you think? Paper plates on shoulders? Ruffles gone wild? You be the judge! 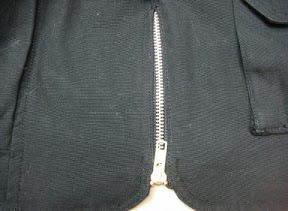 Sweater tops often come with an invisible zipper at the neck, closing the mock turtle neckline. This lady tugged too hard on this one and it separated. Using the same process as I did in putting a new invisible zipper into a formal , I was able to give this sweater top some new life. As always, I spent a few minutes examining the garment. Sweaters can be tricky. You have to determine if the pieces have been knitted together or sewn by machine. I had to figure out what would happen when I started ripping the old zipper out. It looked to me like the "mock" turtle neck might be knitted together around the zipper. That would make this job a nightmare, if the fabric came unraveled as I ripped the zipper out. I also had to be careful ripping out the stitching. I did not want to accidentally start ripping out the yarns that were the basis of the sweater. It turns out that the facing and the fashion fabric were 2 separate pieces after all. Putting in the new zipper was pretty much routine.! As most of us know, those in law enforcement have to rely on a lot of gear to help them in their jobs. Much of those items go on a belt, or two, that an officer wears. In addition to that, he will often wear a protective vest. In this case, the officer had a difficult time getting his vest to fasten over all that bulk. He asked me to insert zippers in the side seams in order to give him more room. 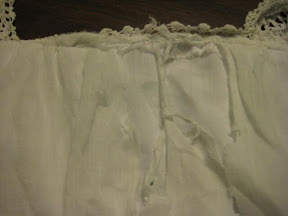 To begin with, I ripped open the side seams with a seam ripper. This was a bit time-consuming because the vest was so well constructed! 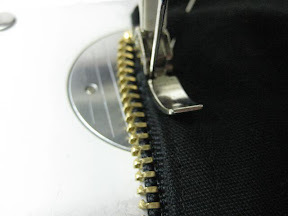 I cut a black jean zipper down to size, by creating a thread stopper at the length I wanted, then cutting off the bottom excess. Then I basted this into place. Then I stitched it, using a jean needle. I think it turned out really well. 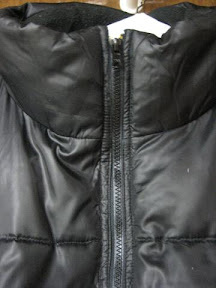 As you can see, it zips from the waist upward until it reaches the snap. I'm happy to help out anyone who puts their life on the line for my safety. Thanks, officer! I have written a L-o-n-g page on how to alter the waist in a pair of khaki pants. 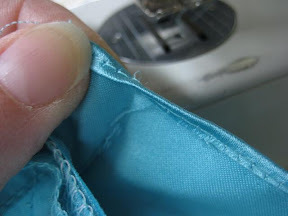 It includes instructions for adding a seam to the waistband. 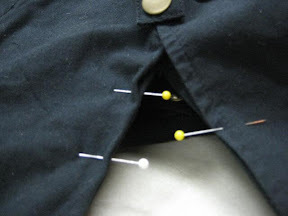 You can use these same directions to take in the waistband in a pair of jeans. Check it out at LearningAlterations.com and see what you think! 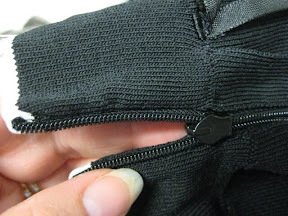 Today I have uploaded two videos that demonstrate how to repair a hole in a sweater. 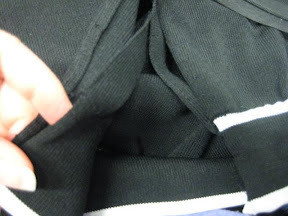 The first one uses white thread on a black knit, so you can see the stitches. The second one uses black thread on the same knit scarf, so you can see the finished product. Feel free to add a comment and let me know what you think! Once in a while, a formal dress with many layers gets to the store with an uneven hem. 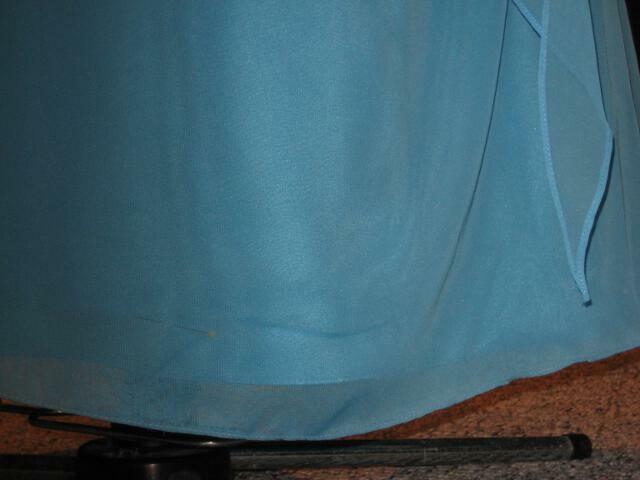 This prom dress had 3 layers. The outer layer was polyester chiffon. 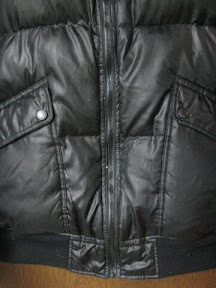 The second layer and the lining layer were each a lightweight polyester. Together they look nice and create enough fullness to give a swirling look to the dress. When pinning this up on the girl, I try to make the second layer about 1½" shorter than the chiffon. That way if it moves at all, when the girl moves, it will remain under the chiffon layer. The lining layer (that closest to the body) should even be 1 or 2 inches shorter than that. When all is finished, you don't notice how much difference there is between the layers, but you'll notice right away if the underneath layers are too long. Give yourself enough difference between the two so that the dress can shift and flow and still look well done.